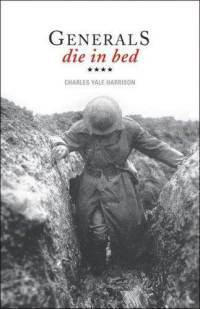 First published in 1930, Generals Die in Bed by Charles Yale Harrison is a powerful and harrowing anti-war novel based on Harrison's own experiences serving as a machine gunner in France and Belgium with the Royal Montreal Regiment in the First World War. Narrated in the first person, present tense (a tricky one to get right!) by an unnamed young Canadian soldier who, by the time he is wounded at Amiens, is the sole surviving member of his section, General Die in Bed is a story that will stick with you long after you put the book down. I think this is a hell of a good book. It is a plain unvarnished account of things without any literary frills - it ought to be a good antidote for all the gush of ain't-it-awful literature which romanticizes war in a subtle sort of way. Generals Die in Bed has a sort of flat-footed straightness about it that gets down the torture of the front line about as accurately as one can ever get it, I think. I stumble along the trench looking for my section. It is quite dark, there are no lights in the sky. No moon, no stars. I reach the front line. I recognize faces. My name is called. It is Fry. He grasps my hand and shakes it heartily. His face is serious. "You did fine, I hear," he says. "They're all talking about it. You're going to get he M.M." "He got it," Fry replies. "Right over here." He points a finger. "As soon as the barrage started they sent over a couple of heavies. A hunk of shell caved his helmet in. He's down at the M.O. 's dugout." I dash off down the trench. I begin to cry. Tears stream down my face. Events that are too horrifying to contemplate are related in this factual manner, which offers the appearance of them being less horrifying than they really are, and replicates the coping mechanisms used by the soldier. Yet, at the same time, this emotional detachment increases the horror we, the readers, feel at the brutalizing effects of the trench conditions, and the effects of warfare on the soldiers. Harrison repeatedly uses imagery to reveal through contrast or irony such as the rain concealing his tears, and gently pinging his helmet in contrast to what has just happened to Cleary's helmet. We have learned who our enemies are - the lice, some of our officers and Death. Of the first two we speak continually, the last we rarely refer to. Strangely, we never refer to the Germans as our enemy. In the week-old newspaper which comes up from the base we read of the enemy and the Hun, but this is newspaper talk and we place no stock in it. Instead we call him Heinie and Fritz. The nearest we get to unfriendliness is when we call him "square-head." But our persistent and ever-present foe is the louse. But this blase attitude toward the enemy does not stop them from the terrible acts they were forced to commit against the boys in the other trench just as innocent and pathetic as themselves. The real enemy are the voices that propagate the need for war, such as businessmen who are getting rich from the manufacture of wartime necessities. I buy the tickets for the theatre. Inside the performance has started. Oh, it's a lovely war. When we have plum and apple jam? The tempo is quick, the orchestra crashes, the trombones slide, the comic pulls impossible faces. The audience shrieks with laughter. Gladys laughs until tears roll down her face. The chorus marches into the wings. A Union Jack comes down at the back of the stage. The audience applauds and cheers. The fat comic - the half undressed actresses - somehow make me think of the line. I look about me. There are very few men on leave in the theater. The place is full of smooth-faced civilians. I feel they have no right to laugh at jokes about the war. "Don't you like it, boy?" "No, these people have no right to laugh." "But, silly, they are trying to forget." "They have no business to forget. They should be made to remember." The narrator expresses more outrage at the behaviour of the Londoner's in the music hall than he ever does at the Germans he is fighting. I highly recommend this novel! 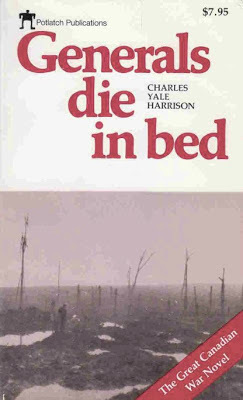 Anyone who enjoys novels about the First World War, or books written with a sparse, reportorial style similar to Ernest Hemingway's will find Generals Die in Bed a stunning achievement. The imagery will stay with you long after you put the book down. This moving anti-war novel is most impressive when he allows us to experience the real trauma and sacrifice as well as sharing the narrator's realization of the futility to all the suffering. The truth of his perspective lies in the authenticity of his words. He is not there to prove or disprove any philosophical arguments about war - he records his experiences and allows the reader to draw his/her own conclusions. This looks interesting! Thanks for the review. It really is fascinating! And makes the unimaginable experiences from that time a little more real. Let me know what you think if you read it!